Let’s be clear: Even if you use only a little bit of a copyrighted song or give the performer credit, you’re still violating copyright if you don’t have a license or other permission to use the music. The same goes for using copyrighted images and video clips in videocasts. But plenty of this material is available for you to use. The term podsafe has appeared to describe music, sounds, and other clips that are available for free, unlimited use in podcasting, but no specific license exists to identify that a clip is podsafe. Read the terms and conditions before you integrate sound or audio into your productions. Creative Commons is an organization that has evolved a set of licenses that you can use on your own content to permit or disallow use by others. 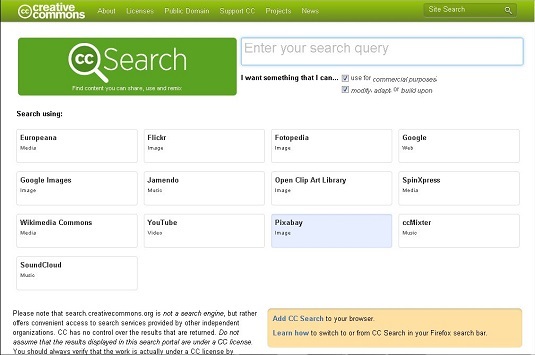 If a publisher applies a Creative Commons license that allows republication, you can search for and find that content in the Creative Commons search area, specifically requesting content that you can use for commercial purposes or modify. Search Creative Commons for licensed content to use in your podcast. Commercial Use: Permits use of the content for business and revenue-generating purposes. Noncommercial Use: You may use this media only for noncommercial podcasts. Attribution: You can use the work only when you give credit to the creator. Derivatives Allowed: You can cut, chop, and excerpt this media to create new works. No Derivatives Allowed: You must leave the media intact and unchanged. Magnatune is a record label that helps artists promote and share their music, and make money doing it. The label and artists sell their albums on CD and via download, and they split the money evenly. The music on Magnatune is available for download and purchase, as well as to noncommercial podcasters. 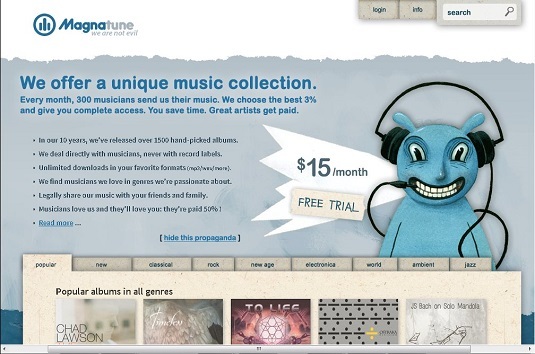 To help promote artists, podcasters are granted a waiver to use Magnatune music without paying a royalty fee. Magnatune is one of the only record labels that specifically allow noncommercial podcasters to use music for free. This online database, Freesound, is the result of a collaborative effort, bringing Creative Commons–licensed sound effects to the Internet for use in podcasts. The Free Music Archive is another online database that allows podcasters to search for music to use in their recordings. It is free to access and use the database, but be sure to check out artist bios and information regarding the use of their art.